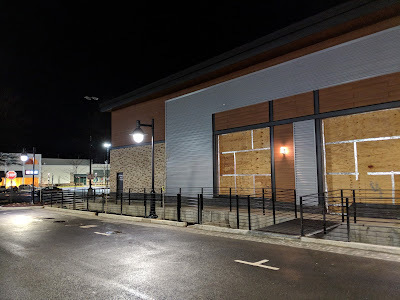 The new retail-restaurant structure that is replacing Timpano Italian Chophouse at Montrose Crossing is nearing completion. Each individual restaurant and store still has to complete fit-out of their respective interiors. 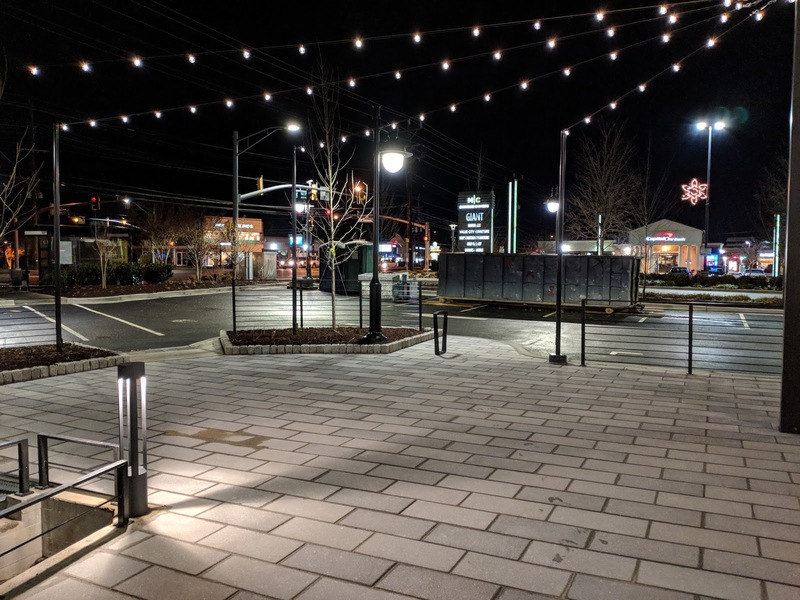 You can see the design, complete with stringed lights, pavers and decorative street lamps, is a nod to the contemporary "town center" more than to the old-fashioned strip mall. 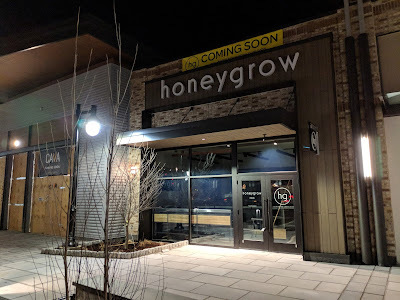 Honeygrow is closest to opening, with their permanent sign already installed on the facade. 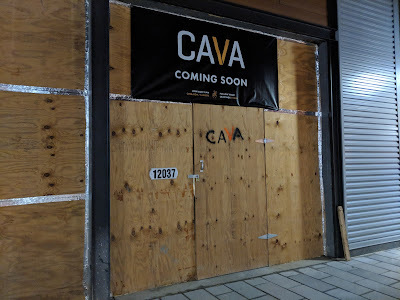 CAVA Grill has Coming Soon signage in place. 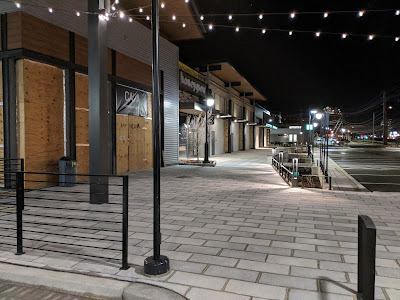 Expect this to be one of the buildings that continues to operate when Montrose Crossing is redeveloped as a mixed-use property in future years. 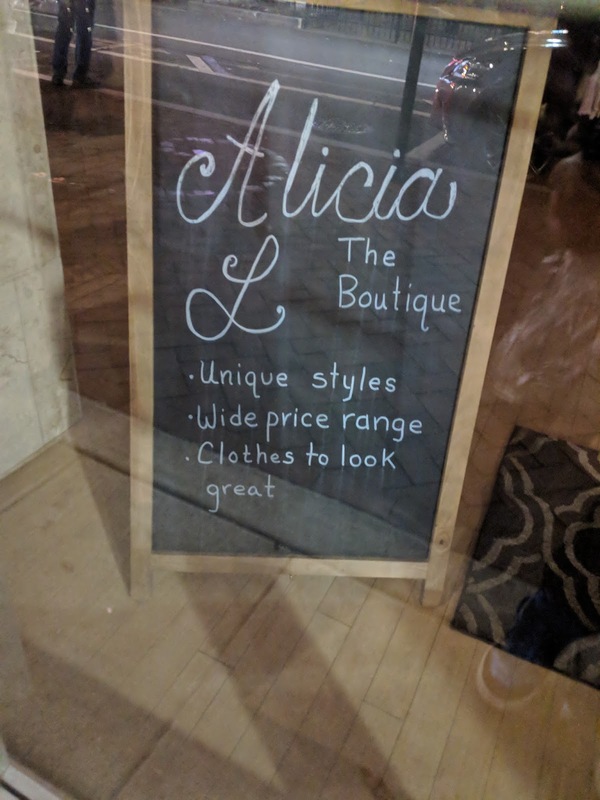 Alicia L: The Boutique has opened at 107-D Gibbs Street at Rockville Town Square. 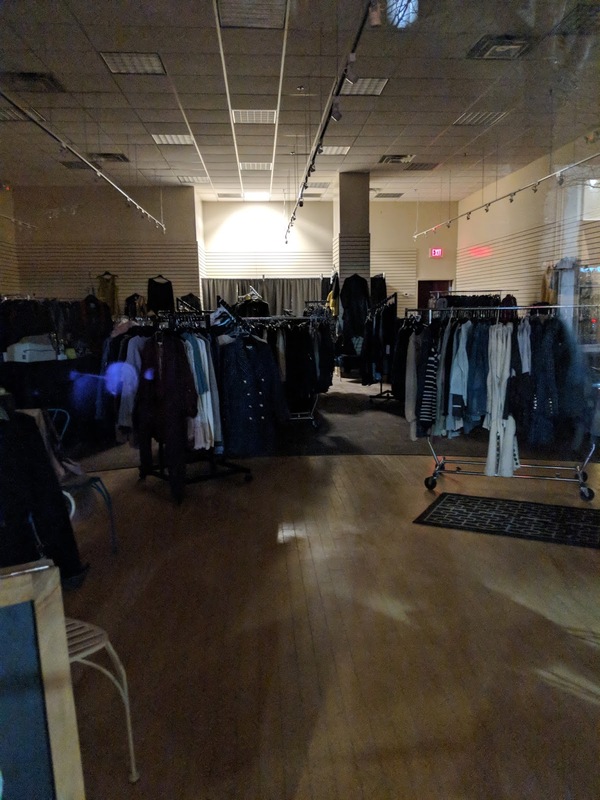 The pop-up shop sells a wide variety of women's apparel and accessories, including labels such as Clara Sunwoo, Aldo Martins, Vineyard Vines, Hunter Boots, Joseph Ribkoff, Katherine Barclay, Comfy, Swell Water Bottles. 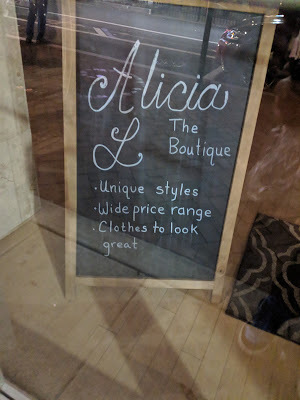 Alicia L's main boutique is in Frederick. 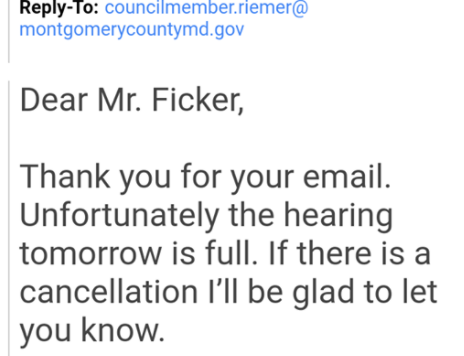 Montgomery County Council President Hans Riemer rejected County resident Robin Ficker's request to testify at a hastily-scheduled public hearing Tuesday on a bill that would allow pre-payment of property taxes before December 31. Ficker is running against several members of the Council for the office of County Executive. This was a clear conflict-of-interest for the Council in excluding Ficker's testimony, as he would surely have discussed the Council's record property tax hikes in his remarks, and the narrow tax relief the bill would provide for only one tier of taxpayers. 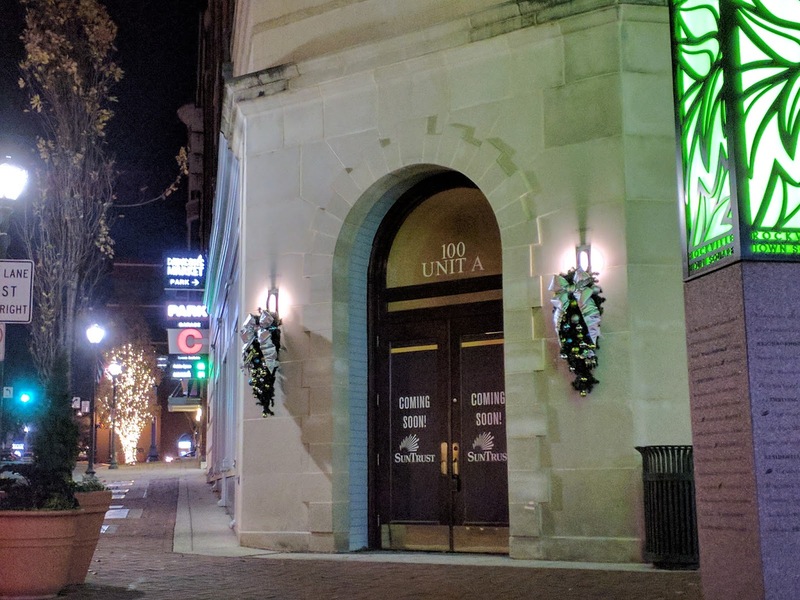 Some of his opponents on the Council used the taxpayer-funded Council public relations office to issue statements praising themselves following the hearing Tuesday, despite being the ones who forced County residents to pay more than $10,000 in property taxes in 2016. Ficker's exclusion raised eyebrows because the Council had all day to listen to testimony; this was an emergency session and there was no other item on the agenda, as anyone can confirm by examining it. The Council recently used a similar tactic to limit public participation in the debate over a proposed expansion of Old Angler's Inn, which left more observers in the hearing room than actual speakers. 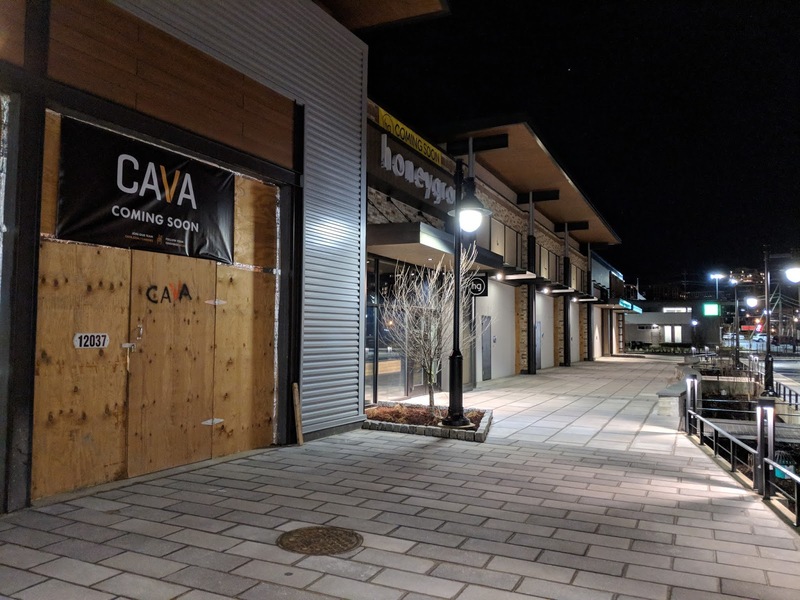 The tax bill passed 7-1 yesterday, with Councilmember Craig Rice voting against it, and Councilmember Tom Hucker absent. It remains uncertain if all or any taxpayers who pay more than $10,000 in property taxes will be ultimately be able to prepay and/or save money. 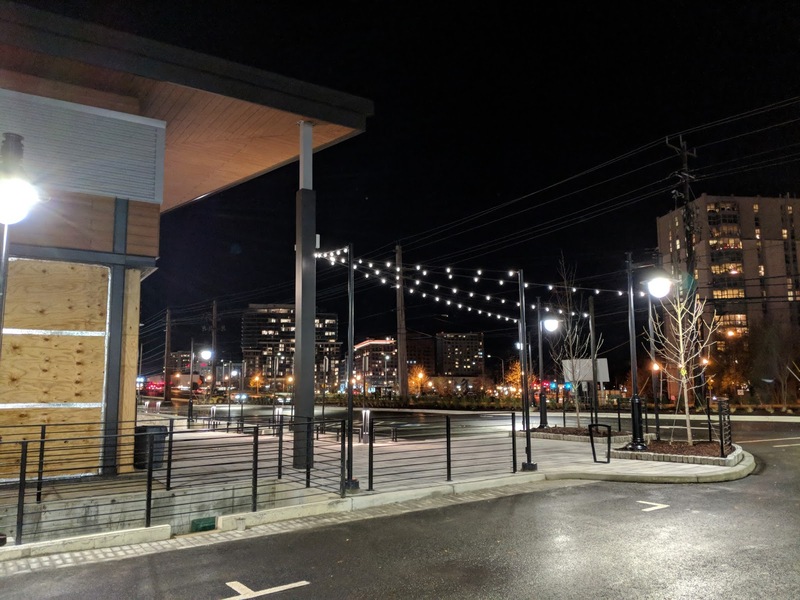 But councilmembers were forced to reverse their opposition after other local jurisdictions quickly allowed their residents to prepay. Many of those paying that amount were only put over the $10,000 mark by the Council's record 2016 and 2017 tax hikes. 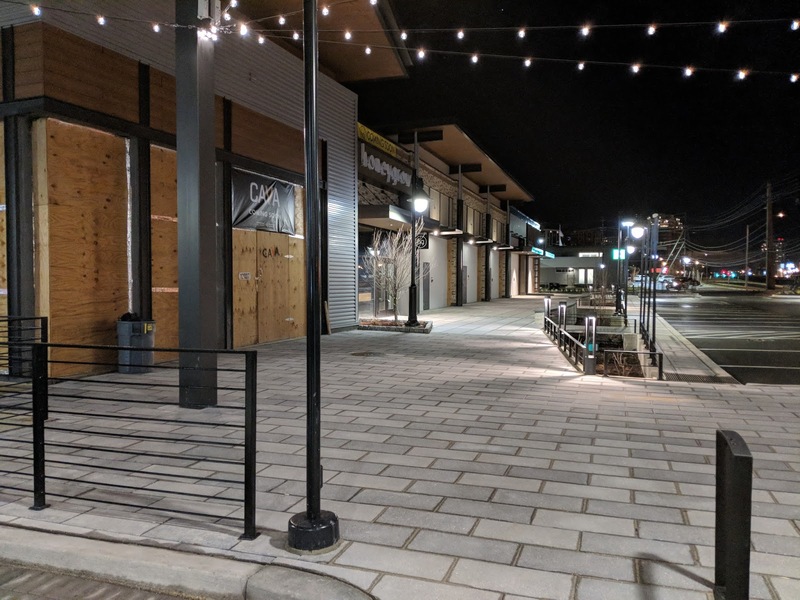 While the Council took pains to blame Donald Trump, who is unpopular in blue Montgomery, it was the Council themselves who put so many of those affected by the federal tax changes into that position. 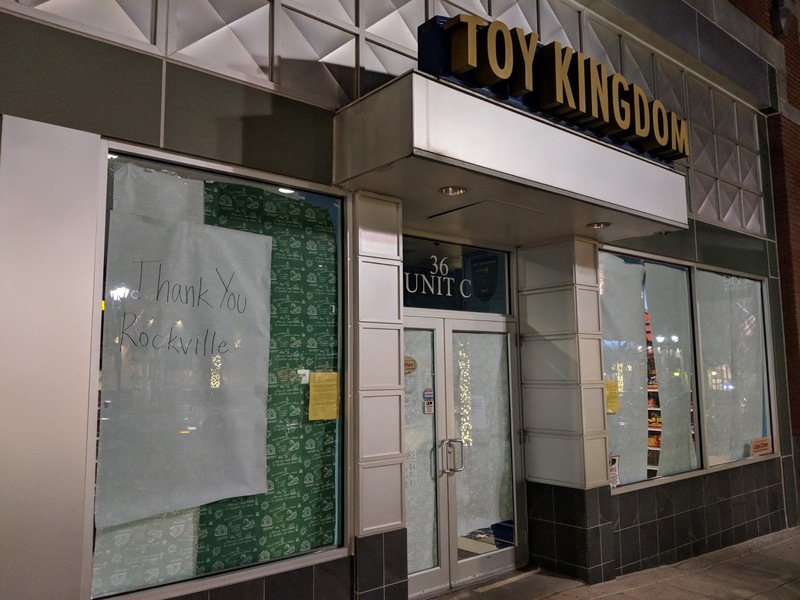 Toy Kingdom has closed at Rockville Town Square. The independent toy store had been scheduled to close its doors forever on December 31. 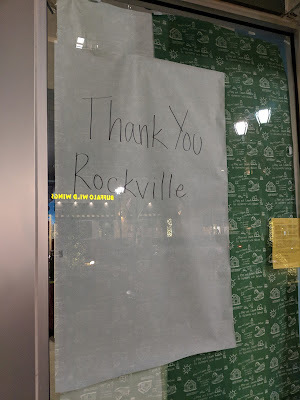 However, the windows were covered with paper this weekend, and a new sign posted in the window thanking long-time patrons for their support. Exposed: Montgomery County Council is not a "full-time job"
Wouldn't you like to have the power to raise your own salary? In doing just that, to a record $137,000 taxpayer dollars, the Montgomery County Council justified the cash grab by claiming serving on the Council was "a full-time job." That claim, already easily proven false, has now been totally debunked, after Councilmember George Leventhal released a statement yesterday announcing he has secretly been earning a doctorate in public policy. In fact, Leventhal has been on a Rodney Dangerfield-esque return to college since 2007, by his own admission. He has been on the Council since 2002. Surely, his ever-increasing taxpayer-funded salary over the last decade has afforded him the ability to pad his thin resume with degree after degree, an advantage not available to many of the constituents paying his salary. Council observers have known for some time that members have too much free time on their hands. 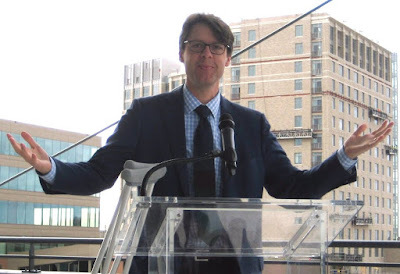 New Council President Hans Riemer recently spent a day on Capitol Hill, trailed by taxpayer-funded County government TV crews to capture it all. 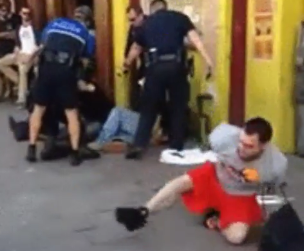 Alas, things went awry when Riemer found himself being arrested by police in Washington, D.C. later that day. It's believed he is the first Montgomery County Councilmember to be arrested while in office. Montgomery County celebrity Matthew Lesko has been selling books on how to get free money from Uncle Sam to earn a "GED, or a PhD!!!" on TV for years. Winning a County Council seat could actually be a smarter move at this point. Sit on a padded leather chair for four hours a week, and the rest of the time, earn a law or medical degree at taxpayer expense using your amped up Council salary. Maybe even hit up a few frat house parties in-between. The Bell, California Council jacked up their own salaries, too, raising taxes massively to cover the costs. Sound familiar? 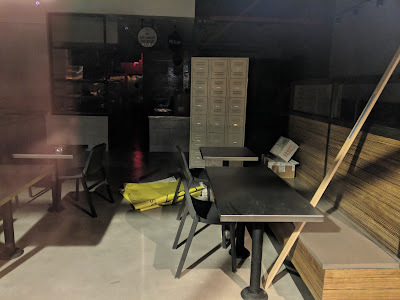 Bell's Council is currently in prison. Montgomery's is on campus. 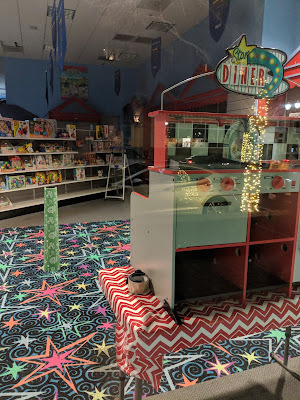 What's wrong with this picture? A resident of the Montgomery County men's emergency shelter at 600 East Gude Drive is unaccounted for, according to Montgomery County police. Nathaniel Lee Robinson, 27, has been reported missing by shelter staff. Robinson is described by police as an African American male, 5’ 9”, and weighing approximately 200 pounds. He has black hair and brown eyes. 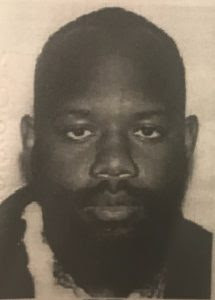 Anyone with information regarding the whereabouts of Nathaniel Lee Robinson is asked to call the Montgomery County Police non-emergency number at 301-279-8000 (available 24 hours). Callers may remain anonymous. 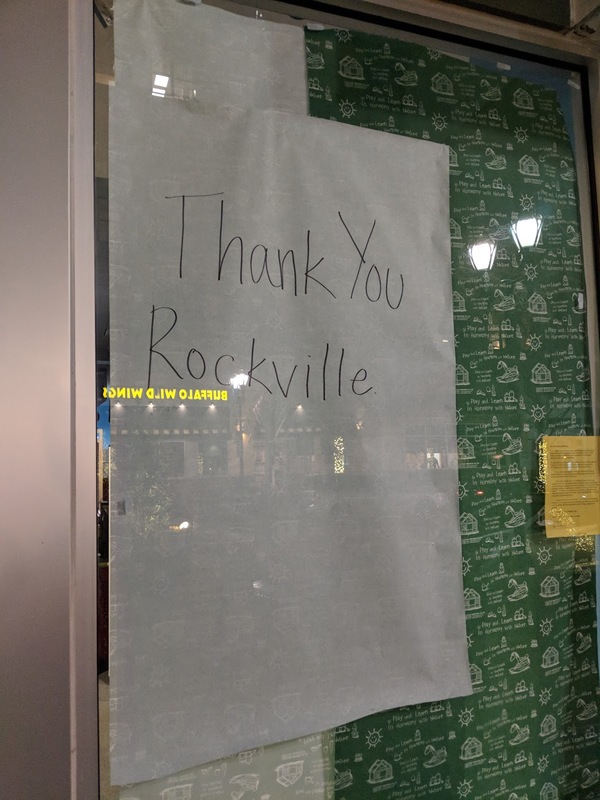 Richard Gottfried, a Rockville resident and candidate for Montgomery County Council At-Large (D), is calling on municipal governments like Rockville and Takoma Park to call an emergency meeting in response to the federal tax plan expected to be signed into law by President Trump before Christmas. Gottfried, a CPA, is recommending municipalities in Maryland pass legislation that will allow residents of those jurisdictions to prepay their property taxes. The move would allow residents affected by a new cap on property tax deductions in the federal plan to avoid higher taxes this year. 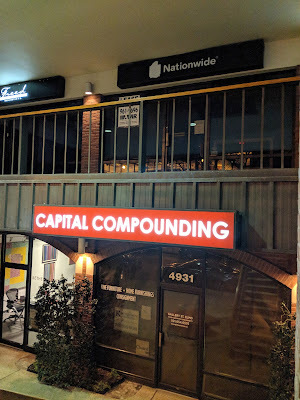 "By prepaying your city property taxes before December 31, 2017, you would be able to take advantage of your property tax deduction in 2017 before the new federal law takes effect in 2018 and the tax deduction is eliminated for homes valued at over $750,000," Gottfried said Wednesday. "The residents of incorporated cities such as the City of Rockville, Takoma Park and Gaithersburg will lose this city property tax deduction opportunity in 2018, and our current elected officials need to come back from their holiday break to City Hall to pass this most important legislation to benefit the residents that they represent!" When Rockville and Montgomery County police responded to an accident involving a driver now charged with DUI Saturday night, they set up a road closure around the scene at Rockville Pike and Templeton Place. In the process, they managed to catch two additional drivers allegedly driving under the influence. Two Rockville police officers arrested a 27-year-old man who slowed and stopped at the barricade, appearing confused, around 1:50 AM on December 17. Almost exactly two hours later, a 20-year-old female driver approached the two-police-car roadblock. She ran over cones, and almost hit officers, before continuing through the roadblock. Ultimately, a County police sergeant pulled her over down the road, and arrested her. 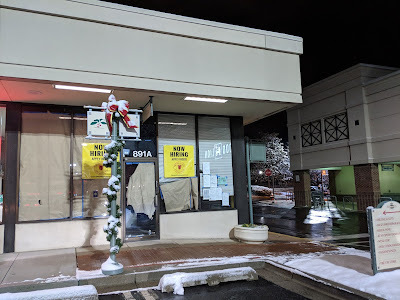 The Montgomery County Council building is just overflowing with Christmas spirit, as the Council is taking the initial steps before the holiday break to criminalize the homeless. This isn't the first time, as the Council tried this previously in their last term, but ran into controversy, including a report from a national organization that condemned the effort. With Council Bill 39-17, they will again attempt to ban panhandling in the County. 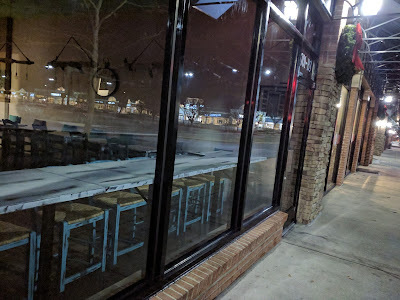 The Council memorably claimed last time that the majority of those who panhandle are not actually homeless, but "professional panhandlers" who drive into the County each morning from out-of-state. That's probably news to the folks in downtown Bethesda and Silver Spring whose main wheels are shopping carts filled with everything they own. What's driving the Council's mania to criminalize the homeless? Well, it may just have something to do with politics and the election year ahead. 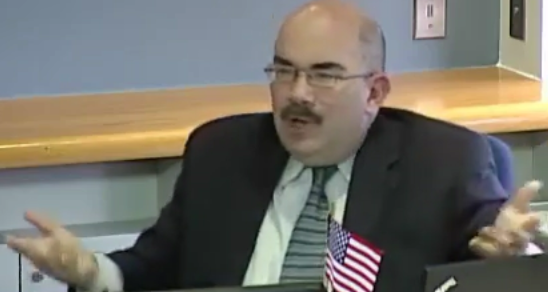 Councilmember George Leventhal has given himself loud credit for supposedly finding homes for every single homeless veteran in Montgomery County. The local media hasn't bothered to fact check Leventhal on that claim, and simply print it as fact. In reality, it's almost impossible to verify such a boast, which is probably why Leventhal is making it. Now Leventhal has promised to house every single homeless person in the County by December 2018. Conveniently, that will be a month after the election, in which Leventhal is running for County Executive. Wouldn't it also be convenient to use a panhandling ban to clear the homeless from their most-visible perches on County roads, to make it appear as if they aren't there? They've just banned circus animals, now the homeless...think they'll get around to dealing with that $120,000,000 budget shortfall anytime soon? 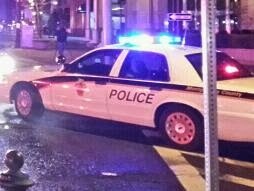 Montgomery County police are investigating a fatal collision that occurred Saturday night in Rockville, around 11:15 PM. 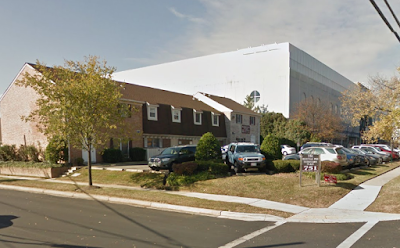 Rockville resident Ross Stanley Redler, 56, was traveling southbound on Rockville Pike, nearing Congressional Lane. 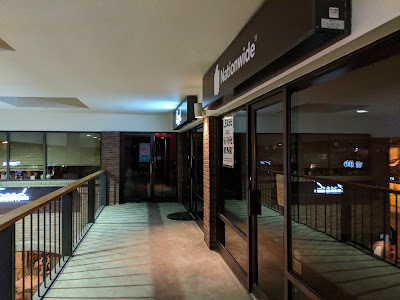 A 2008 BMW 335xi was making a left turn from northbound Rockville Pike onto westbound Congressional Lane, and struck Redler's 2014 Tao Tao Scooter. The BMW driver, Mark Steven Andrade, 24, fled the scene, but was located by police and arrested for DUI. Redler passed away at an unidentified local hospital. Andrade was not injured. Anyone who witnessed, or has information about, this collision is asked to call the Collision Reconstruction Unit at 240-773-6620. Nationwide Insurance has relocated from Cordell Avenue in Bethesda to 751 Rockville Pike in Rockville. They are in Suite 6-B. The new office is next to the Marlo Furniture showroom. The future home of The Halal Guys at Wintergreen Plaza has some Coming Soon signage up in the windows. There's still a ways to go inside, however. 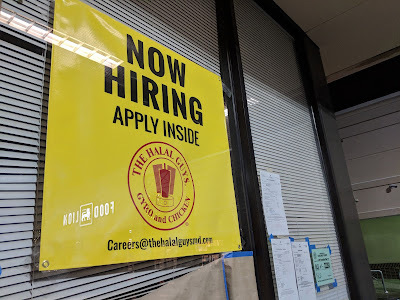 As you can see in the photo below, they are also hiring staff right now. SunTrust Bank has posted Coming Soon signage at its future home in Rockville Town Square. Their space at 100-A Gibbs Street was a bank in the past as well. 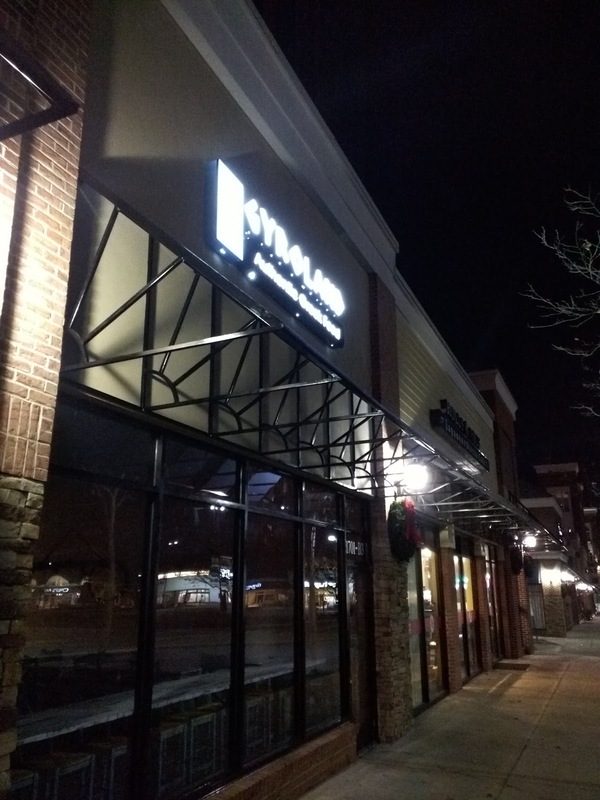 Gyroland has opened at 1701-B3 Rockville Pike, in the Shops at Congressional Village. 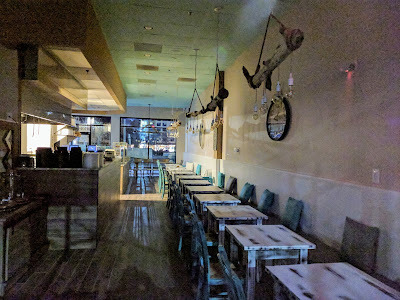 They have a good selection of Greek appetizers, gyros, souvlaki, and loukoumades, which you might describe as Greek beignets. 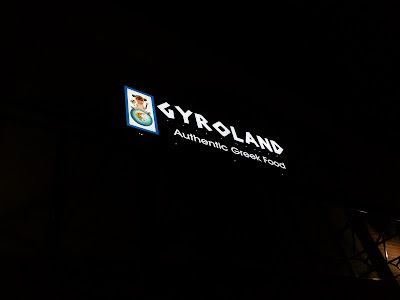 Gyroland is open from 11:00 AM to 10:00 PM daily (I believe they opened the morning after these photos were taken, because they were taken long before 10:00 PM). 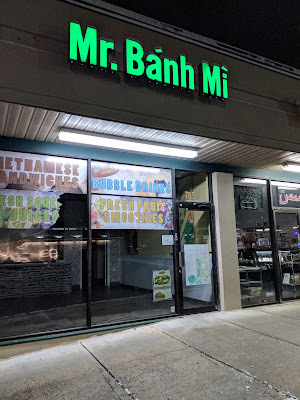 Mr. Banh Mi's dining room has been cleared out at the Ritchie Center on Rockville Pike. 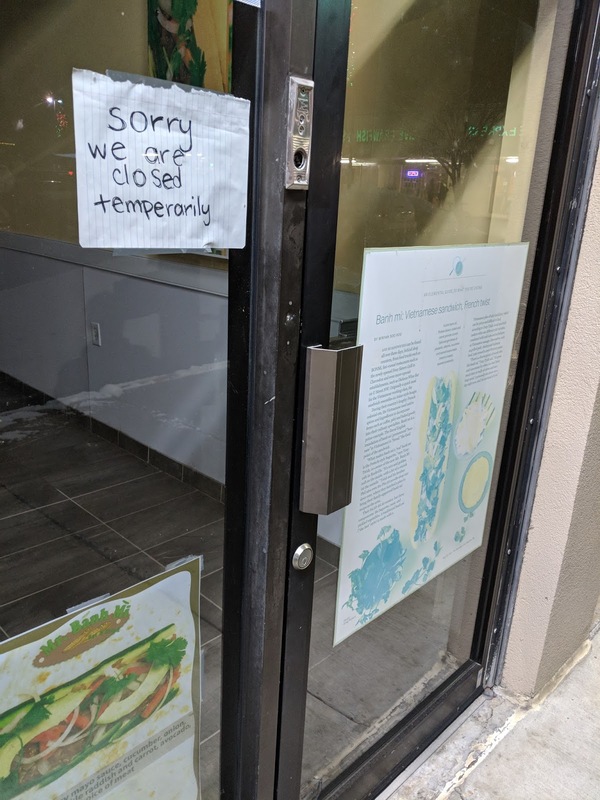 A sign in the window promises the closure is temporary, but offers no explanation. 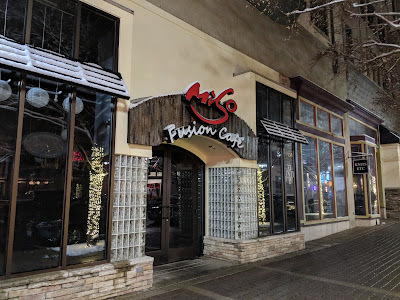 On Sunday, Miso Fusion Cafe was dark during its regular hours. Paper was tacked up over the windows at the Korean fusion restaurant, which opened last year at 33-E Maryland Avenue, at Rockville Town Square. No sign was posted to explain the closure. 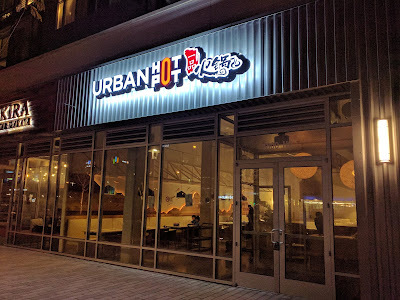 Urban Hot Pot is just about ready to open at the Galvan development at 1800 Rockville Pike. 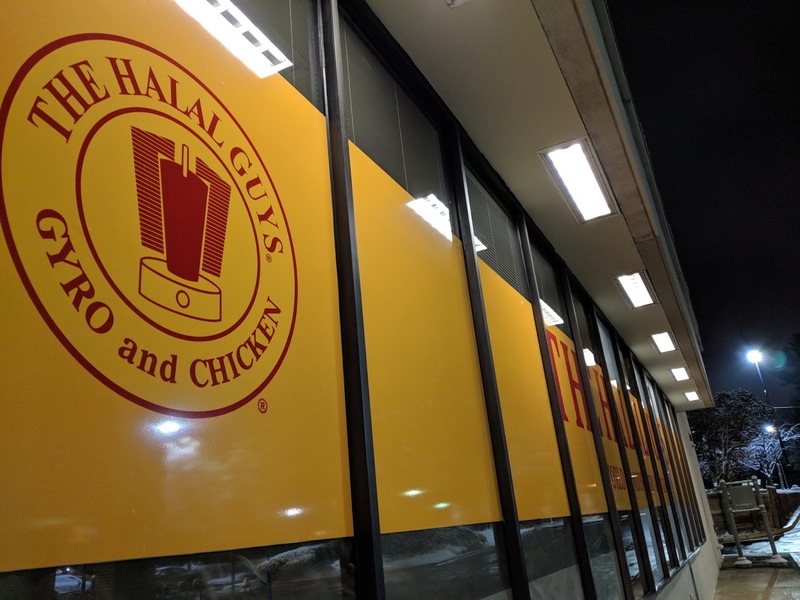 They will hold a soft opening tomorrow, Saturday, December 9, 2017. 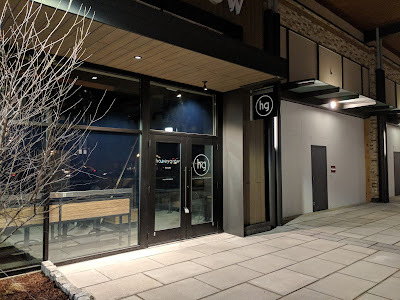 Urban Hot Pot will be an all-you-can-eat hotpot spot, complete with rotating conveyor belt. It is right next to the already-open Akira Ramen & Izakaya. 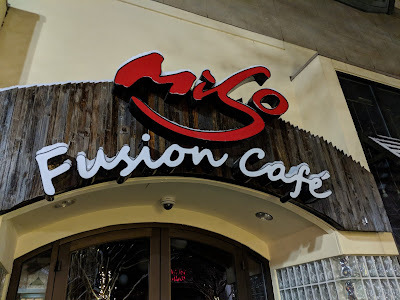 The restaurant is walking distance from the Twinbrook Metro station. A Montgomery County Councilmember who has had trouble obeying the law in the past found himself in handcuffs Wednesday. Council President Hans Riemer was arrested on the steps of the U.S. Capitol by U.S. Capitol Police yesterday, after refusing an order to disperse following an immigration rally. "I was arrested today," Riemer wrote on Facebook last evening. 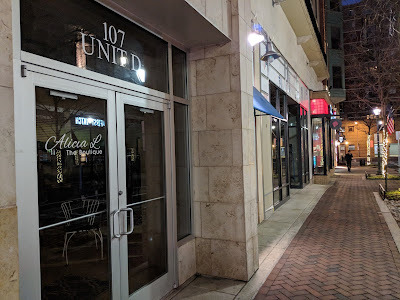 Riemer has promised to introduce legislation to declare Montgomery County officially a "sanctuary county" for illegal immigrants, according to Gustavo Torres, Executive Director of CASA de Maryland. Riemer has run afoul of the law in the past, including violating his own Open Data law this past spring, when he directed that a file required to be posted on the County website be removed. 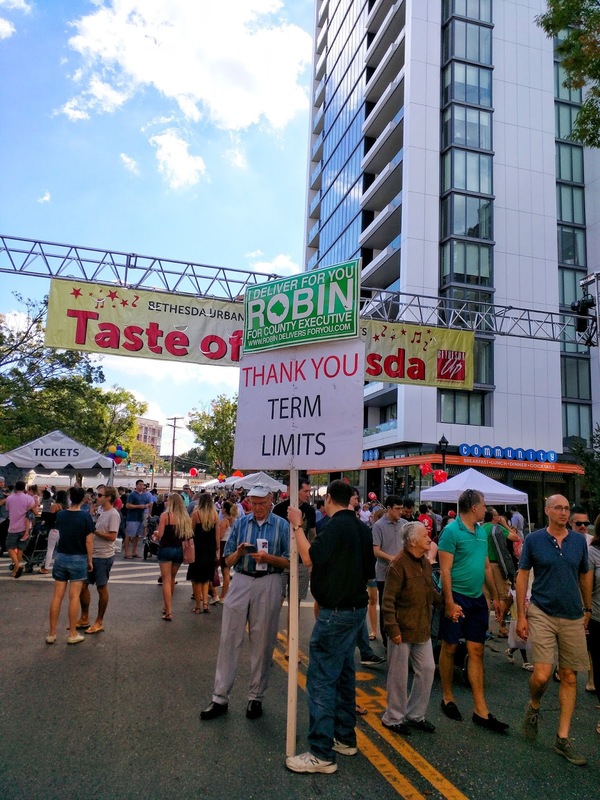 In 2014, he appeared to have inside information on illegal activity in the County's Department of Liquor Control, over which he has oversight authority, but waited to report it until after he was safely reelected that November. 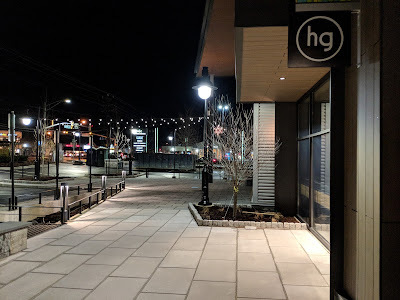 A backroom political deal culminated Tuesday with a unanimous vote by the Montgomery County Council naming Councilmember Hans Riemer Council President for the final year of their current term. 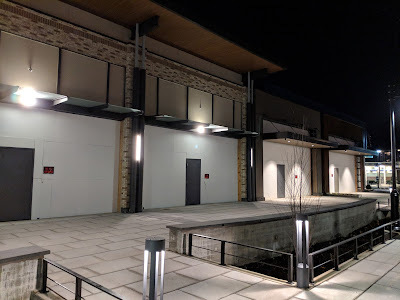 In a rambling seven minute speech, Riemer took aim at the County's established suburban neighborhoods of "cul-de-sacs," which he described as "appealing, if exclusive, suburban communit[ies]" that are home to "those who already have every advantage." 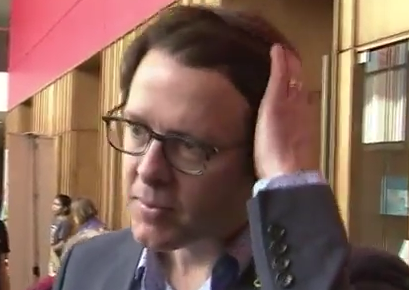 Delivered with a sneering tone and slight smirk, Riemer's remarks echoed those of his colleague George Leventhal a few years ago. Leventhal declared the suburbs "a mistake," and during the Westbard sector plan battle, told residents angry about the plan to urbanize their neighborhood they should just be glad they were "lucky" enough to live there. 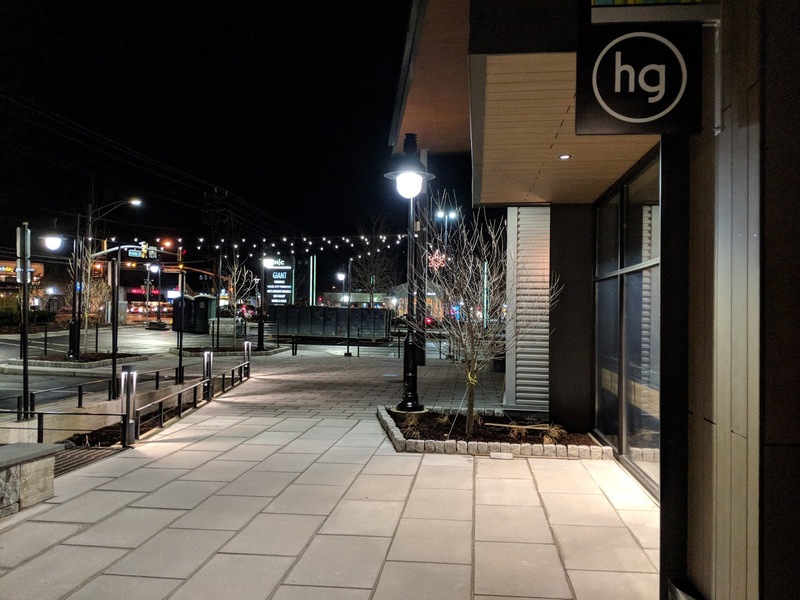 "People used to come here to get away from the city," Riemer said Tuesday, announcing a new "metropolitan" identity for a County where a majority live in leafy, suburban neighborhoods. Riemer appeared delusional when referring to the visceral anger displayed by residents toward the Council in the last several years - a backlash that culminated in the passage of term limits by an overwhelming margin in November 2016. 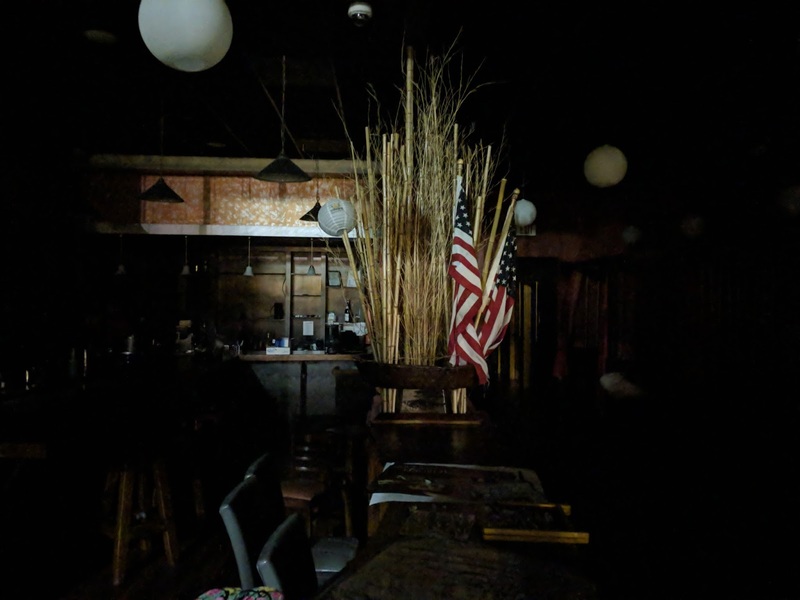 Despite having his own term limited by that vote, in Riemer's world, "emotions in our community are charged" because of Donald Trump, not his own votes for tax hikes and urbanization of existing rural and suburban neighborhoods. Riemer's Trump-like reputation for falsehoods was on full display in yesterday's speech. 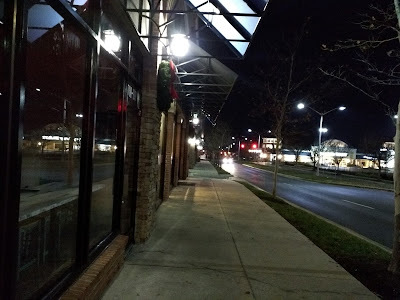 Moments before casting a vote to pass the controversial Westbard sector plan in 2016, Riemer claimed the Westbard community was "a mile from two Metros." That was a four-Pinocchio whopper, given that Westbard is at least two miles from any Metro station, nowhere near the quarter-to-half mile distance universally agreed upon for "transit-oriented development." 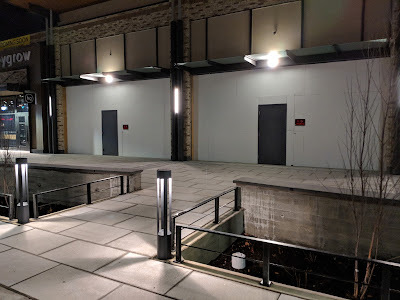 On Tuesday, Riemer stated that the Purple Line would place the University of Maryland "minutes away" from Montgomery County residents. In reality, the light rail's average speed between Bethesda and College Park will be less than 19 MPH. He came up with a new definition for the County's longstanding achievement gap between white and Asian students, and their black and Latino peers. Stunning observers active on education issues, Riemer falsely described Montgomery County Public Schools' gap as only affecting those between the ages of "zero and five." A clever scheme to absolve failed County officials from any blame, but unfortunately, completely false. Riemer was more honest about the County's hated government-controlled liquor monopoly, which he took steps to strengthen and preserve during his current term. 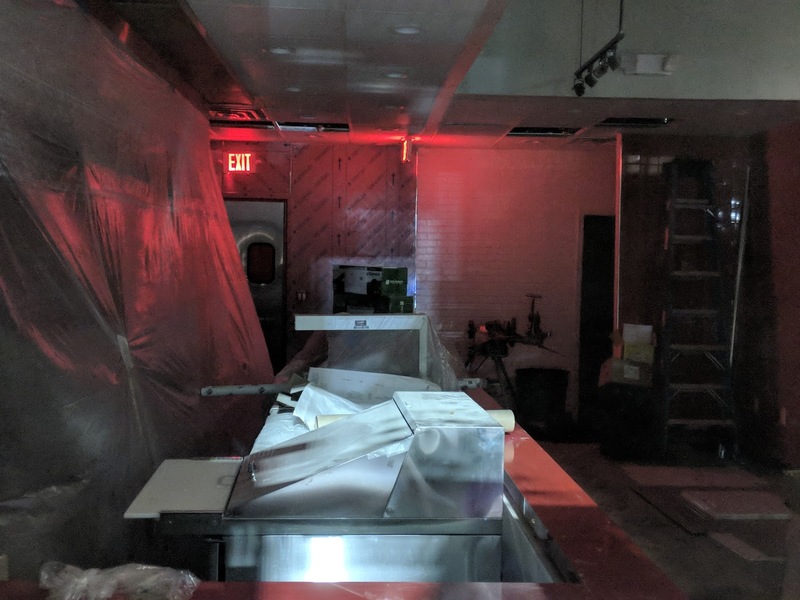 "We may have a reputation for liquor control," Riemer acknowledged. 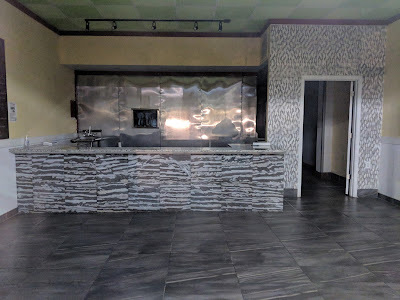 That control has frustrated restaurant and bar owners, who are forced to pay higher prices while getting poor selection and service from the County. Meanwhile, residents are among the few in America who cannot purchase beer and wine from grocery, drug and chain convenience stores.